Step into the world of stunning 7.1 surround sound, a noise cancelling microphone with no background noise interference and a comfortable headband and ear cushion with durable construction. With a promise of durability, superb sound quality and portability, the Plantronics Gaming Headset with surround sound is all you will need for the ultimate gaming experience and more. With Plantronics GameCom 780’s high-end and retro style cans that are reminiscent of aviation muffs, you will never be disappointed with the superb audio quality that this headphone brings. These headphones will supply you with plenty of volume levels but they won’t go so high as to hurt your ears. They sound great when you use them to listen to music, too, although the softer treble and mid tones are sometimes dominated by the strong bass but you perhaps won’t find this to be much of a problem at all since slight EQ tweaks can easily solve this minor issue through programs that support it. 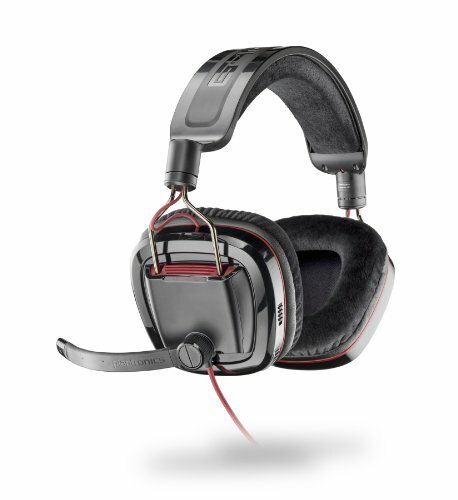 The Plantronics GameCom 780 Gaming Headset, like many other emerging headsets on the market, makes use of the virtual surround sound instead of real surround sound. These headsets use various algorithms to make compelling 7.1 surround sound with two speakers only. By choosing this route and fitting only one speaker in each ear cup, they were able to replace the 20-30 mm drivers in true surround speakers with the larger 40 mm drivers that have a greater dynamic range. This also reduces the strain on your neck because fewer components are used and there are also fewer potential points of failure. When compared to the previous Plantronics Gaming Headset designs, this GameCom 780 Gaming Headset has made some stunning improvements. Instead of having a hefty and inflexible bulk of plastic on the headband’s arm, there is now a tough pair of wire frame rails with gliders for the ear cups so that they can be adjusted to different sizes. This means that the headphones can be adjusted to fit almost any size of head perfectly and with its soft ear pads, it should fit around your ears comfortably. What’s more is that you can swivel the ear cups backwards so that the headphones can be tucked away safely in a backpack or lay quietly on top of a desk. You can also pivot them up and down by a few degrees when you wear them. The unwieldy control pad has also been scrapped and in its place is a microphone switch and a convenient volume rocker on the back edge of the left ear cup. The front side of this same ear cup also has a button for toggling Dolby surround and it glows blue when you activate it. The manufacturers of the new Plantronics GameCom 780 Gaming Headset have also scrapped the optional Dolby dongle and the 3.5 mm mini-jacks. Therefore, you won’t be able to plug it into your average tablet and relax in your car en route to your destination; only a computer will do. This shouldn’t be a problem for most buyers however, who are avid computer gamers and who won’t be using the headphones for anything that is not computer-related. All these changes were in fact very necessary to save you, the buyer a few dollars on your purchase. By using less plastic and only using the technology that is needed, the manufacturers were able to bring the cost of this superb headphone within the reach of average buyers who would love to have a world-class gaming experience but whose budgets will not allow them to purchase the much more expensive alternatives. The plastic on this headset seems firm but some users are not a big fan of the exposed cords that are between the headband and the ear cups. Some even don’t like the blood red USB cable of the headphones. Yet these deal breakers don’t seem to be too much of a bother when you’d take the strength, quality and durability of this particular headphone into consideration. This has to be the best feature of this Plantronics GameCom 780 Gaming Headset with Surround sound from Plantronics to date. It offers the best features for a fraction of the cost! You can do it for yourself; compare all the features of this headphone with all the other top brands on the market and see if it is not an even score, except when you include the cost savings that the Plantronics GameCom Headset brings. These headphones won’t bore a hole in your pocket and you won’t have to compromise on any other essential feature either. You get the best of both worlds with these headphones- quality and value for money. All things considered, this Gaming Headset with Surround Sound by Plantronics is one to beat. Although it is not on top of the “food chain” yet, this gaming headset is a top caliber on its own class. Why settle for less when you can have the best? The GameCom 780 Gaming Headset could be any gamer’s gaming headset of choice under the cheaper end of the market.